Are you spending your Valentine’s Day in Budapest, Hungary? While many of the couples take a romantic Valentine’s Day cruise in Budapest, You can treat yourself and your better half to a nice romantic bath with some drinks, and a refreshing, pampering massage at the most popular thermal bath of Budapest: Szechenyi Baths. Or even a Valentine’s Bath Party in Budapest in Lukacs Baths. Whether you are staying at one of the best spa hotels in Budapest, or any of the romantic hotels, the most important thing is how you actually spend your romantic Budapest break. Spending on the fun, and the romance is an absolute must to enjoy a fantastic romantic holiday in the Paris of East as Budapest is often mentioned. 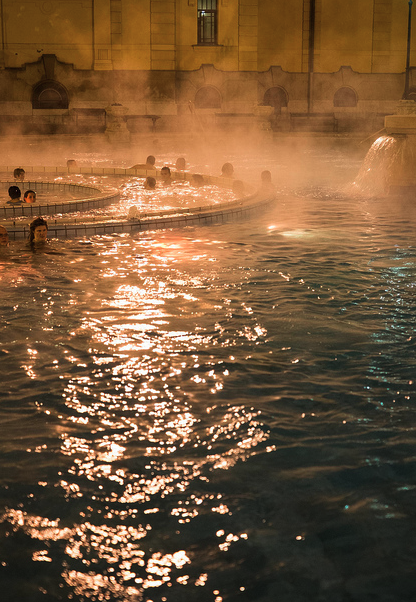 What we recommend for your Valentine’s Day program at Szechenyi Baths: have a champagne in the baths, soak in the warm waters supplied by natural spring wells, get a massage, enjoy the steams and the stars in the open air pools, romantic walks nearby. Now how does that sound for a romantic evening? February 14 is not much celebrated by locals yet, as Valentine’s Day in Hungary has only recently been growing into an event. So in all probability you will not have to compete with many couples who schedule a bath visit on the Day of Love. The busiest hours at Szechenyi Bath Budapest in mid February are around mid afternoon, when the lunch hours are over, but it is still not dinner time. 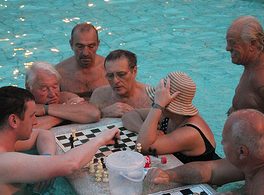 Szechenyi Bath is considerably less packed from around 6-7 pm. At 7 pm all the indoor facilities (pools, saunas, steam rooms, services) close down. But the three outdoor pools are open, two of which are very warm, and warm enough to keep you really warm under the open sky. If you have luck, you can even see a starry night, or a snowfall, flakes dropping into the steam cushion spreading over the outdoor warm baths. 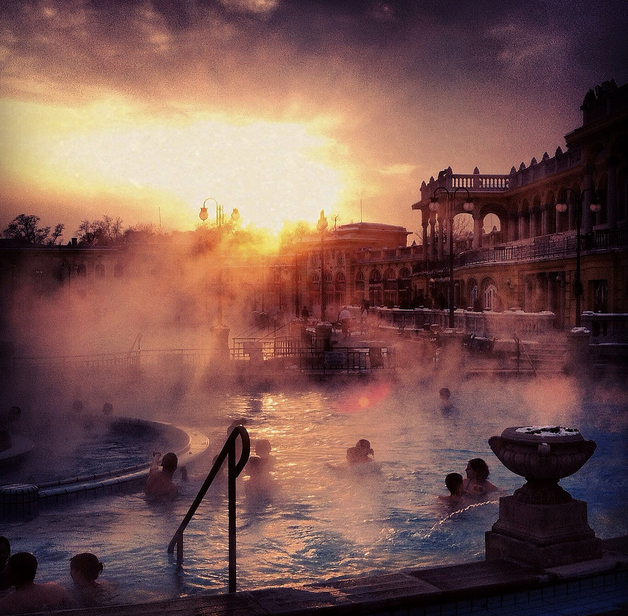 From 7 pm the pools quiet down, most guests leave the baths to enjoy a dinner in a good Budapest restaurant. 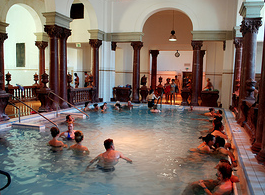 So you can easily spend 2 or 3 hours in the thermal baths, and feel as if you had your palace. Of course, you will not be completely alone, but the pools and the bath is big, much bigger than many tourists think of the 18 pools, so you will have some privacy. The Cafe of Szechenyi Bath is a good snack bar with all sorts of drinks: alcoholic drinks, soft drinks, teas, champagnes, wines or beers are all available from about 7 am to 9 pm. Schedule your Valentine’s Day bath visit slightly earlier to have a chance to try the indoor pools, steam rooms, saunas and plunge pools. And of course to have a massage for two. Many of the VIP massages at Szechenyi Baths are cheaper for couples, who can have the massage simultaneously with the professional masseuses of Szechenyi Bath. 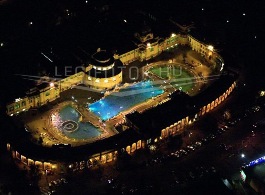 As Szechenyi Bath is located in the City Park, it is a very romantic place indeed. In the City Park you can walk to the Vajdahunyad Castle, the Budapest Ice Rink (open air skating rink and a palace, another great option for a romantic fun), the Heroes’ Square with its many historical statues, and fine museums, and of course, Andrassy Avenue, which is part of the UNESCO World Heritage. 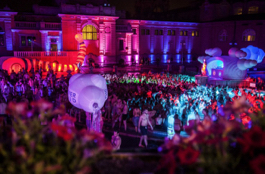 Next Bath Party Tickets On Sale! I will arrive budapest on 2 Feb, could you tell me does the Bath will open on 3 Feb 2017? 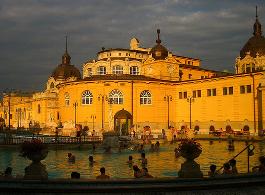 Szechenyi Baths is open every day throughout the year, including the days in February. 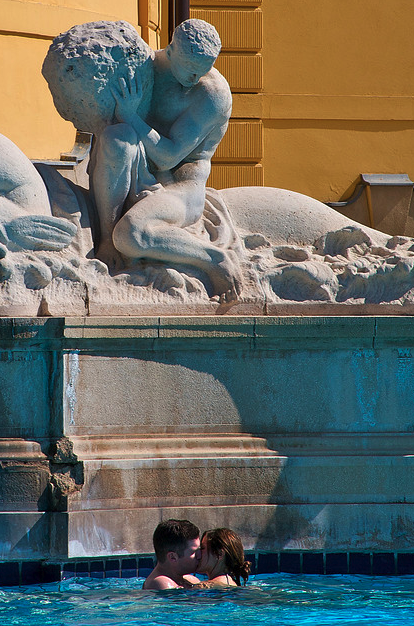 Have a great time in Szechenyi Baths in Budapest.